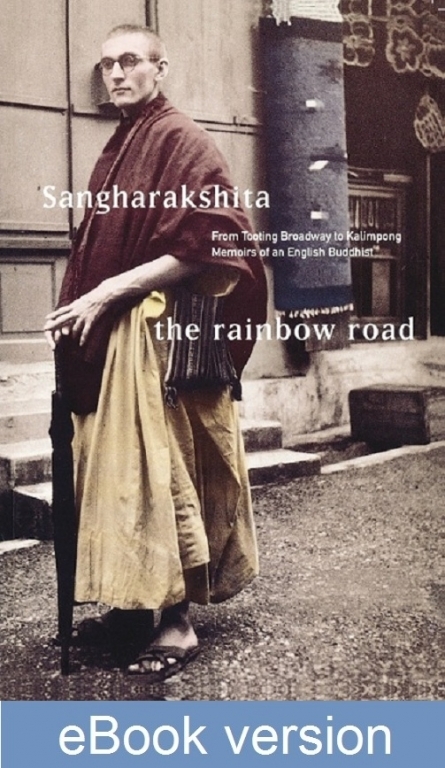 The Rainbow Road traces Sangharakshita’s development from a childhood dominated by illness and books to homeless wandering and ordination as a Buddhist monk. The most recent edition of this book is found in Volume 20 of The Complete Works of Sangharakshita, and is available in hardback, paperback and eBook format. At the age of sixteen Dennis Lingwood discovered that he was – and always had been – a Buddhist. This realization was to act as the motive force behind a life in which Lingwood, now better known as Sangharakshita, has played a major part in the introduction of Buddhism to the West. The Rainbow Road traces Sangharakshita’s development from a childhood dominated by illness and books to homeless wandering and ordination as a Buddhist monk. The Rainbow Road is a remarkable and refreshingly candid record of a journey of spiritual exploration.